We’re about to pre-order some Delaware chicks. This means I’m counting chickens before they’ve hatched. I might as well start counting the pennies I hope to make from them. 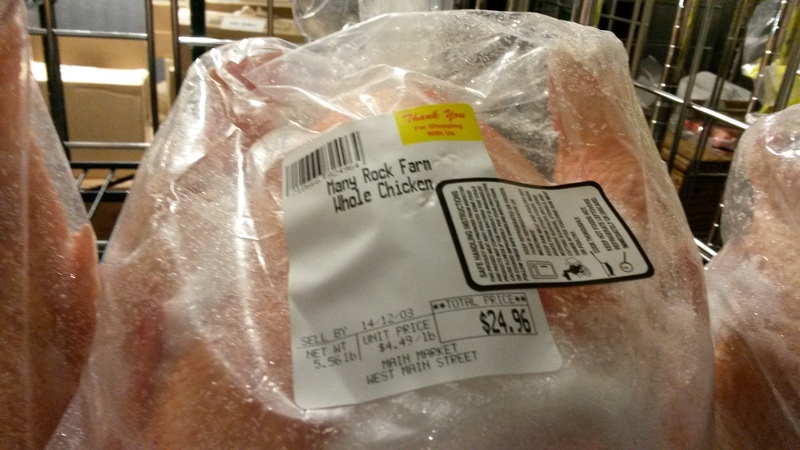 I went on a field trip to check the local prices for chickens, eggs and turkeys. I want to be clear that I don’t consider the brands I investigated to be competition. I think there’s plenty of room for pastured poultry products here. It’s also the wrong time of the year production-wise. This may throw off the price or even the quality of the product. Let’s take a look at chicken first. This was in a market that offers a lot of healthy/organic and local products. So, this chicken is a nice size. It’s 5.56 pounds. They’re offering it at $4.49 a pound. Many Rock Farm has really good market penetration. In addition to this market, they have a booth in a year round farmers’ market. They’re local and they are chemical free. There’s a lot to admire about them. I’m not sure what I think about their price. Let’s skip the fact that we’re almost three weeks past the sell by date. That could be a store issue. The bird is frozen, which in my mind means it isn’t as fresh. Does that mean an unfrozen bird would be more? Something I’ll have to think about. 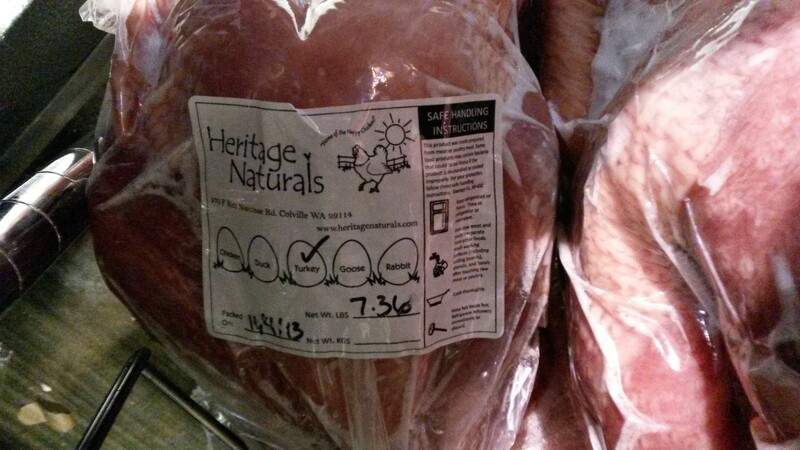 Heritage Naturals raises chickens, geese, ducks, turkeys, rabbits and pigs. below is a picture of one of their turkeys. Remember that I said this wasn’t the best season to do research? This is a 7.36 pound turkey. This is probably all that’s left in the store freezer after the holidays. Let’s look at the price. 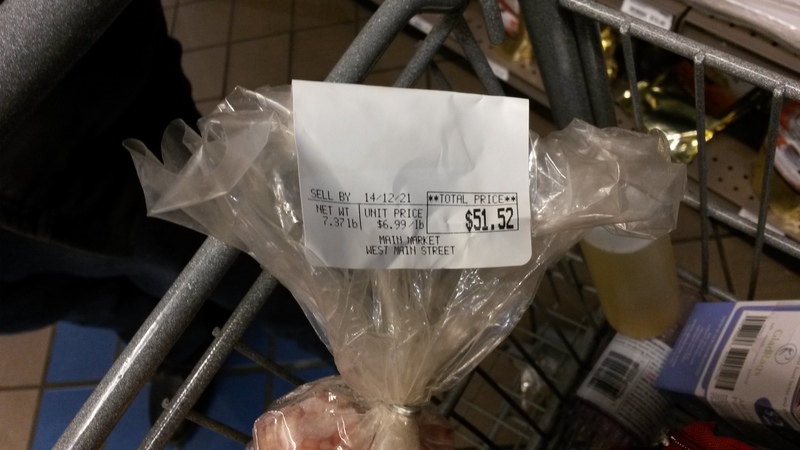 The turkey costs $6.99 a pound. That’s actually in line with what I was guessing. A 25 pound turkey would go for around $175 at this price. 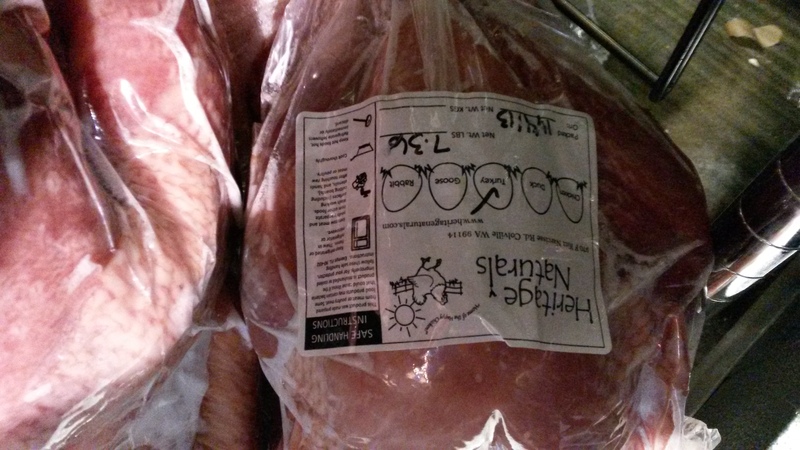 I’ve heard of heritage turkeys going for $200. I’m very excited about this! 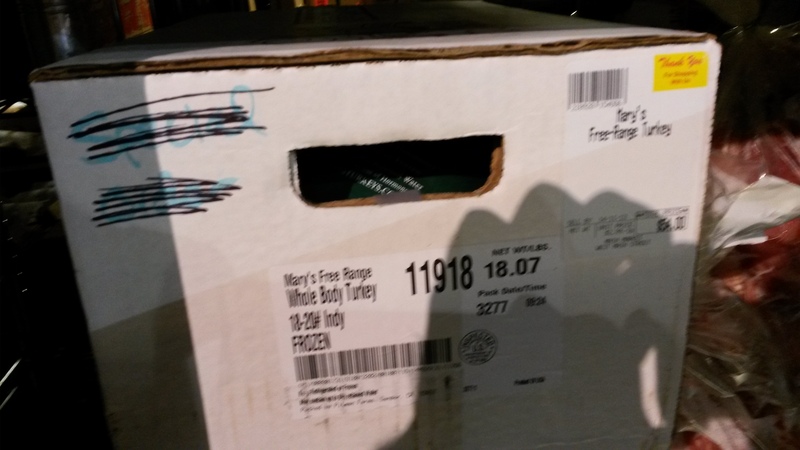 Below, we’re at the same store, looking at turkey brought in from California. My apologies for the blurry pic. This is an 18 pound turkey that is priced at $54 dollars. That a $3 a pound price. I’m bummed out about this. Fortunately, I feel that local farms and unfrozen turkeys will have an advantage over this product. This is a different store, but the same brand, Mary’s, cut up chicken. 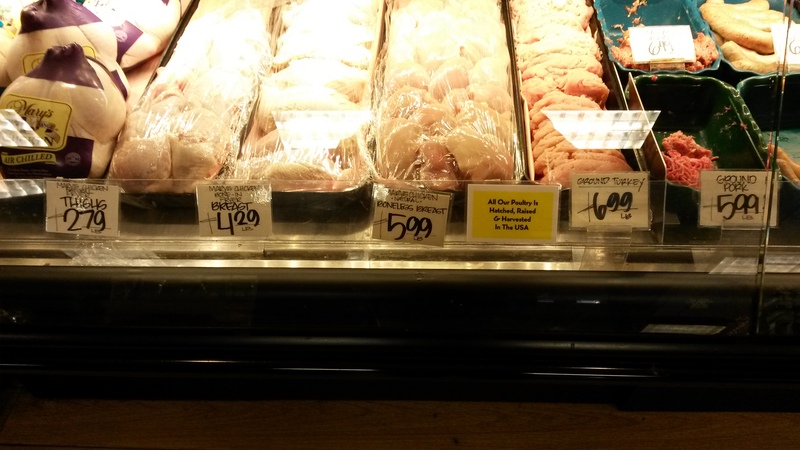 Thighs are $2.79, breasts are $4.29, boneless breasts are $5.99. I can’t compete with these prices. Hopefully, the local fresh aspect of my product will allow for higher prices. Let’s take a look at eggs. The big stores sell eggs for $1.99 a dozen. Out in the sticks, eggs go for $2.50 to $3. How about in town? 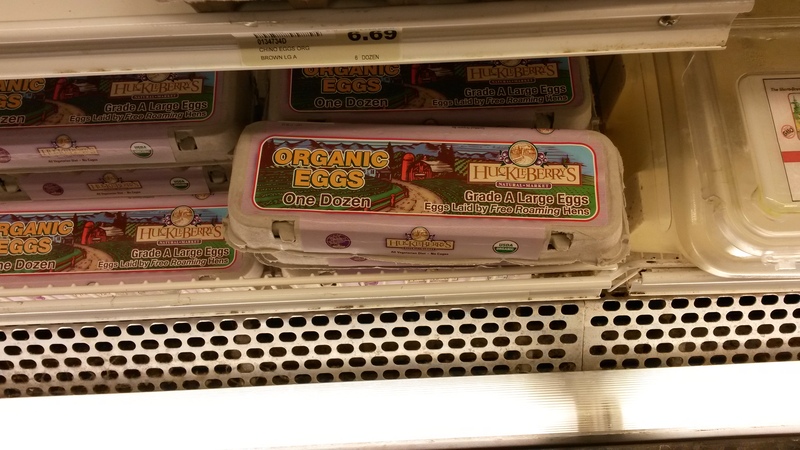 These organic eggs were on sale, $4.50 marked down from $5. That’s good news to me. I plan on selling somewhere in that price range. All in all, I think the prices look good. I need to work on my marketing since The “easy” venues have something similar. My apologies to those of you that were looking for something more along homestead lines. This research is vital to the success of my land. I think being able to sell your produce is inline with sustainability. Our plans are to go along those same lines, The price of food continues to climb…those prices you posted are outrageous, but must be the norm in California. Those prices are from Spokane, Washington. I’m a contractor working in California right now, but the homestead is in Washington.